Unique Identification Authority of India – UIDAI, was announced to launch ‘facial Recognition’ service for aadhaar users, but due to some technical issues UIDAI recently said that Facial Recognition facility will be delayed by some more days. By doing hard works most of the people’s finger prints was erased and their fingers was not scanned at biometric process, in that situations they are not able to get the aadhaar related benefits which is provided by State government or center government. Most of the people suffering at the time of Civil supply benefits, old age pension benefits and the social schemes. Official News: Aadhaar Issued organization UIDAI for facial Recognition facility will be delayed by one month. The scheme is to be implemented from July 1st to August 1st with the intent to enforce without any problems as noted by the unique identification authority of India (UIDAI) CEO Ajay Bhushan Pandey has been said while the Aadhaar is currently scanned for IRIS, Fingerprints. the UIDAI has been decided that facial recognition is also to be added in Last year, UIDAI have already in that work it’s a technological knowledge related matters so it can be take some time. UIDAI is getting ready to be fully prepared. This is a step towards a new direction. 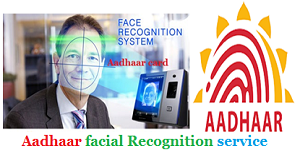 hope this facial recognition service will helpful for aadhaar users. in all over India. Ajay Said that they were trying to run from August 1st it is delayed for a few months.